Perfect place to have a fulfilling breakfast! Wide variety of choices, but heavy crowd – so better be early! The curry noodles at Xin Quan Fang is a MUST TRY! Known for its signature magic curry sauce, it pairs well with succulent meat slices ranging from steamed chicken, prawns, signature char siew (BBQ pork) and siu yok (roast pork). This is an ABSOLUTE FAVOURITE! 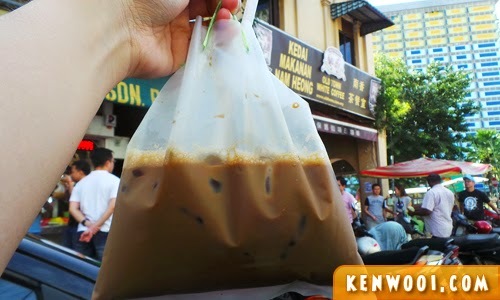 Known as the origins of the famous Old Town White Coffee, Nam Heong Coffee Shop is a hot spot for those looking for local Chinese delicacies and the famous Ipoh white coffee! Parking can be a pain though. If you’ve missed out on Xin Quan Fang in the morning, Big Tree Foot at Pasir Pinji can be an alternative. 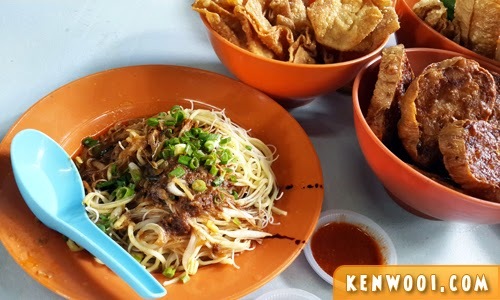 Known for its curry noodles and especially its wide variety of fried fritters (also known as yong tau foo) – you’ll be spoilt for choice! Imagine a spring-like texture steamed rice noodles match-made with a mixture of sauces garnished generously with shallots. 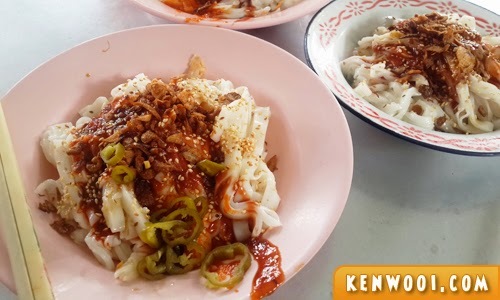 This is possibly the best chee cheong fun you’ll ever find in Ipoh Pasir Pinji Chee Cheong Fun. Drop by from 1pm to 4pm (or until sold out) on weekdays only (except Wednesdays). It’s simple but you gotta love this nasi ganja’s rich aromatic mix of curry gravy. The portion may be small but it’s just right for a quick tummy fill-up before dinner. The custard caramel, on the other hand, is by far the smoothest in texture and its sweetness made to perfection. Yes, there are Lou Wong and Ong Kee, which are prominently more famous. But personally I prefer Cowan Street because it tastes much better and has lesser crowd. 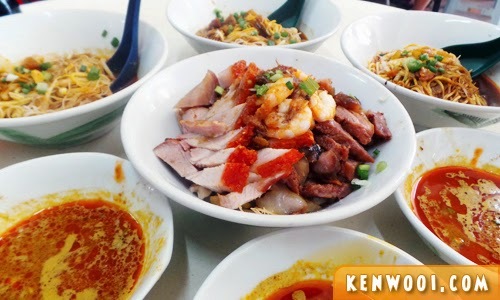 However, you’ll only have kueh teow to accompany the chicken and bean sprout dishes. 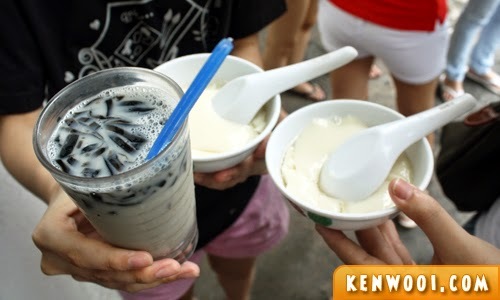 If you fancy some desserts or a late dinner / supper, Tong Sui Kai is the best place to be. It’s an open-air food court with a variety of food (especially desserts) to choose from. 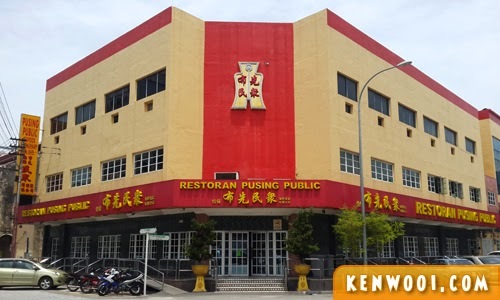 Known for Ipoh’s famous kaya puff, Sin Eng Heong is a must visit place – but it’s better to be early as the queue can go up to an hour or more! 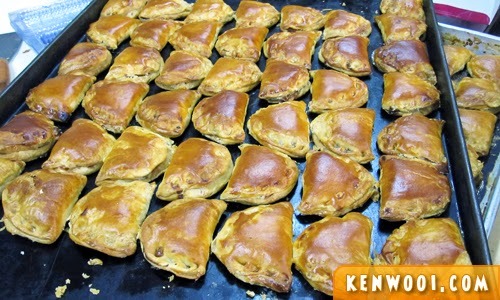 There are other pastries too, but they’re not their best seller. Another spot to have a quick snack is Funny Mountain where you can either queue or join a non-existent “drive thru” lane. Don’t say you’ve been to Ipoh without purchasing salted chicken. 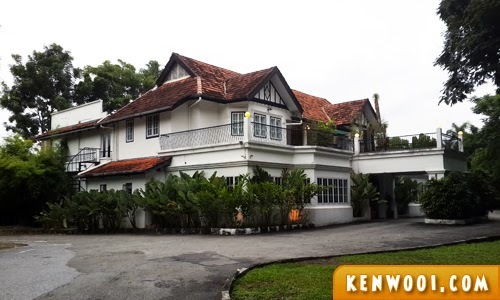 The main place to get it is none other than Aun Kheng Lim. 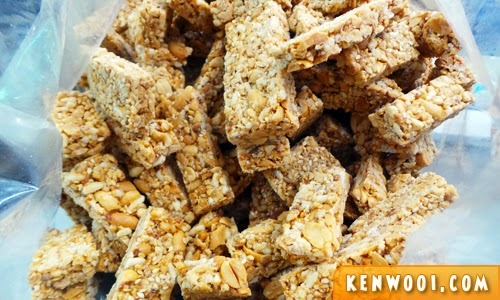 Located close by Big Tree Foot, you can purchase Ipoh’s well-known peanut butter candy at Ming Yue Confectionery. The queue may be long, but there are other pastries available too. Here’s a map with the exact location of what you can eat in Ipoh. They have been colour-coded according to meal types. 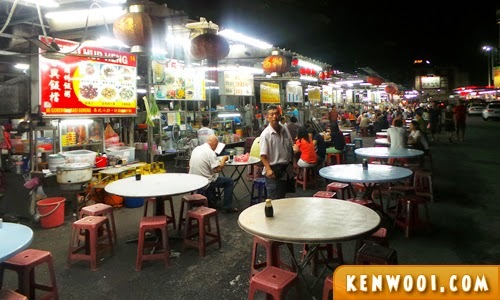 You can also get the Ipoh Food Guide by kenwooi.com on Google Maps. 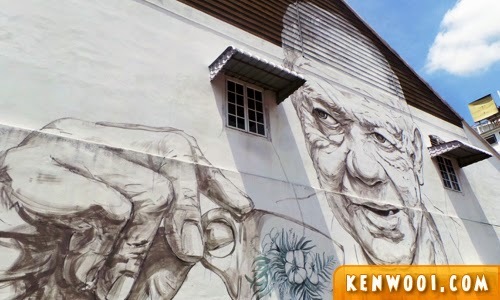 Ipoh Wall Art Murals – Check out the wall murals by Ernest Zacharevic. 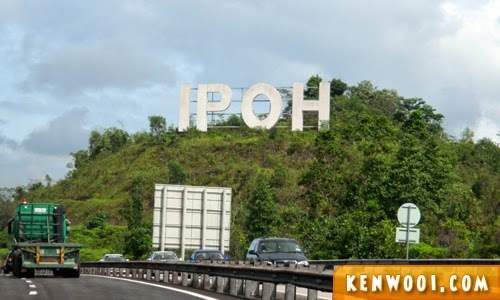 They are located around Ipoh town. 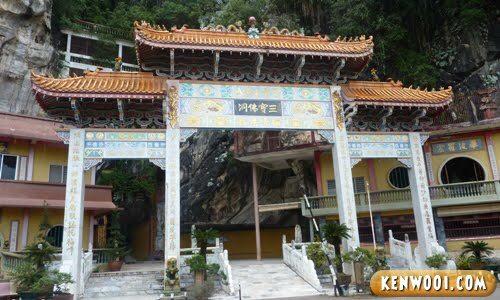 Temple Caves – Ipoh is known for its temple caves such as Kek Look Tong, Sam Poh Tong and Ling Sen Tong. Visit them to catch a glimpse away from the bustling life of Ipoh. 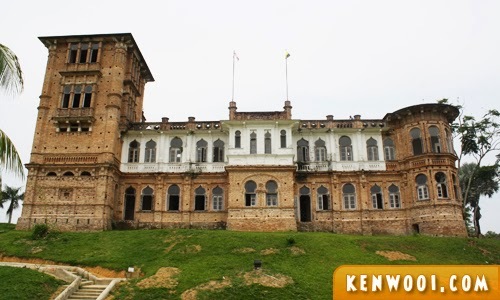 Kellie’s Castle – If you’re up for an abandoned castle adventure, stop by Baju Gajah. It’s about 30 minutes drive out of town. 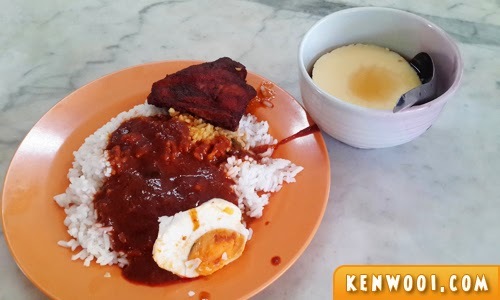 Now that you know what to eat in Ipoh… great! To ensure that you have a mighty fine Ipoh trip, please be reminded to purchase parking coupons to avoid being fined. You can get them at several places around town. 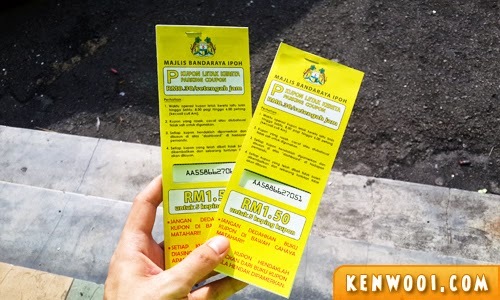 Parking coupons should be used from Mondays to Saturdays (8am to 6pm, except on Public Holidays). well planned and very informative..
Ipoh is indeed a food haven! Missing all the delicious goodies already!